Parijat is an entrepreneur with rich experience having expertise in brand management, e-commerce as well as m-commerce. He is a multi-skilled person having transformed many brands. After completing his post-graduation in international sales, he founded “Matrix Consultancy” in 2001, which is a complete HR & Management Consulting Firm, operating across India. Parijat Pathak really understands your requirement and provides you suitable fit rather than swamping you with unwanted profiles. He is a very good initiator, keen learner, and good motivator. 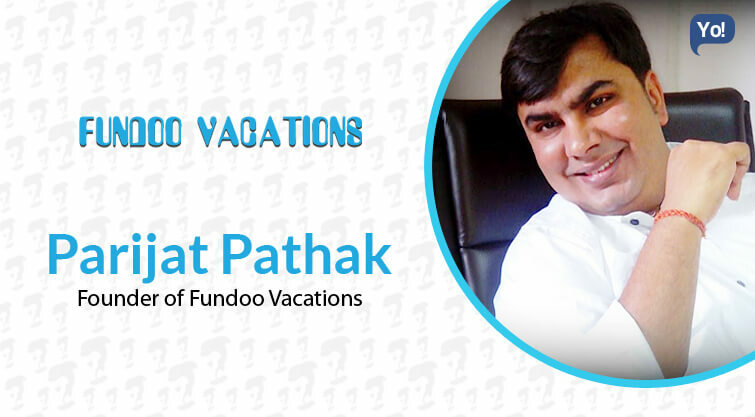 After working more than a decade in the HR industry, he leaped on to the startup bandwagon again to launch Fundoo Vacations. It is India’s leading travel website, offering you the best prices on flights, hotels and holiday packages across India and the world. Fundoo Vacations makes planning and buying a holiday or a business trip easy and convenient. Fundoo Vacations offers Travel Services both online & offline and current product offering consists of Airline Tickets, Hotel Reservation, Vacation Packages, Business Travel Desk, Car Rentals. Recently we started promotion and marketing for Hotels & Home Stays. Two things inspired me to create Fundoo Vacations. First my passion for travel & second I observed that there was a big communication gap between Travelers & OTA’s / Travel agencies. As every company was just pushing their fixed packages without talking & understanding the liking of travelers & their budget. My life mantra is always being creative in whatever I do as the stereotyped process gets over soon. What was the most challenging part of your journey until now? The most challenging part of my entire journey is operating from a small city as most of the client’s thinks businesses operating from small cities will not be able to provide quality service. We have always proved them wrong with best rates & excellent services even better than industry leaders. We are a “0” liability company. 100% self-funded. We started with a small capital and reinvestment of profit is the investment module. Keep on searching & applying new unique ideas. One should always be customer / consumer of its own product/services. Always keep on thinking and searching for new & unique ideas in whatever I do & whatever I see. Expecting 100% perfectness on everything. Keep on working with passion & creativity. Business is not gamble, so, first calculate then invest. Plan & save for cloudy days from day one. As I am a 1st generation entrepreneur so, will prefer to work for few years in the same kind of business to understand the hurdles. Anywhere… but it must be a wildlife destination.